Find here all the information you need on coins and collectables. Greek and foreign coins, bank notes, euros, stamps, medals and more! two profiles were found for Coins-world.info in social networks. Among other social networks the website is represented in Facebook and Twitter. The web server used by Coins-world.info is run by Travel Zone LTD and is located in Washington, USA. On this web server 14 other websites are hosted. The language of those websites is mostly english. 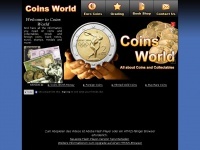 The Coins-world.info websites were developed using the programming language PHP and served by a Microsoft-IIS server. XHTML 1.0 Transitional is used as markup language on the webpages. The website does not specify details about the inclusion of its content in search engines. For this reason the content will be included by search engines. The website contains ads by Google Adsense.